In 1919 D.H. Lawrence turned his back on England and embarked on a journey of self-discovery known as his ‘Savage Pilgrimage’ which took him across Europe, Asia, Australia and Mexico. 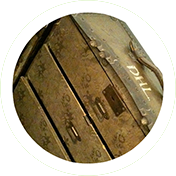 Accompanying him on his journey was a travel-trunk which had various compartments and drawers. Paul Fillingham and I (James Walker) want to retrace this Savage Pilgrimage, explore Lawrence’s significance as a writer, and develop his personalised travel-trunk as a ‘Cabinet of Curiosity’ or Memory Theatre. We are aiming to build and launch our Memory Theatre to coincide with the centenary anniversary of Lawrence’s exile. It will journey in both physical and digital form. It will be a beautifully crafted work of art in its own right, to be explored and admired, stopping off at key locations. The drawers will contain real objects including; documents, poetry, paintings and essays, produced by a variety of creative practitioners. Some drawers will house interactive touch-screens, offering a glimpse into the digital heart of the Memory Theatre. The Memory Theatre will journey in both physical and digital form. It will be a beautifully crafted work of art in its own right, to be explored and admired, stopping off at key locations. The drawers will contain real objects including; documents, poetry, paintings and essays, produced by a variety of creative practitioners. Some drawers will house interactive touch-screens, offering a glimpse into the digital heart of the Memory Theatre. The digital component will be available as a web-service across various media platforms. Users will virtually ‘open’ drawers with content geared towards the capture and sharing the users’ experience. As the Memory Theatre travels in physical and digital form, its aesthetic and emotional value will grow, accumulating its own savage history and provenance. Dawn of the Unread (2014 – 2016) – an online graphic novel serial exploring Nottingham’s literary history. The comic is unique in that it includes embedded content in panels, providing contextual information to enable deeper reading. Winner of a 2015 Guardian Education Award. It’s also a book. And an App. The Sillitoe Trail (2013 – 2014)– exploring the enduring relevance of Alan Sillitoe’s Saturday Night and Sunday Morning for BBC/Arts Council multimedia platform The Space. Also available on iTunes.